When it comes to resources for the travelling public to inform them what’s happening on our BC highways, DriveBC is pretty great. Whether it’s info on construction (current or planned), rock slides, avalanche, maintenance, special events, vehicle collisions, inland ferry delays, or updates on when our roads will open or services will resume …basically anything that could impact your travel plans is shared on the website. But how does the information go from “in the field” to on the website? 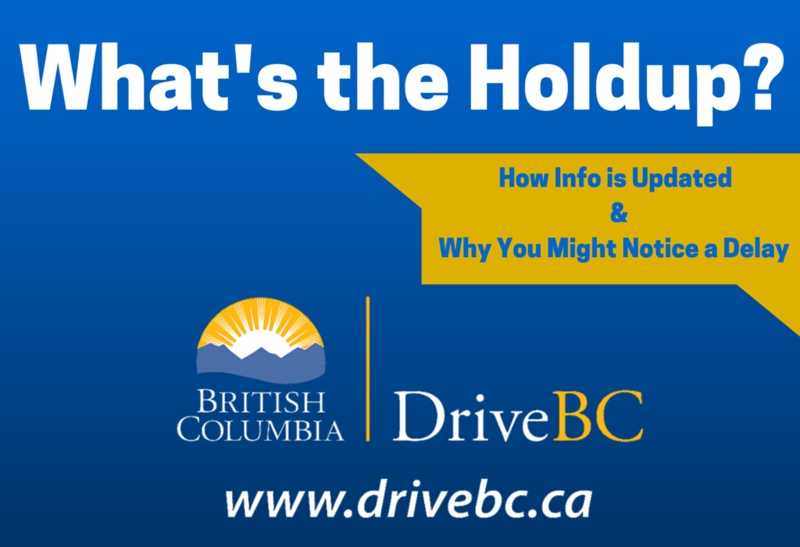 Updates to DriveBC are initiated by our ministry staff or maintenance contractors on the scene, including details (if available) like location, what’s going on, when the next update will be, whether there’s a detour and when the estimated opening time is planned. Once the update is inputted into the system, it’s displayed on the website within minutes. Ministry staff and maintenance contractors make every effort to stay informed, providing updates on DriveBC quickly, regularly and as conditions change. You can help too. There’s a feedback button on DriveBC which you can use to share information. When we hear from you about a road closure, the DriveBC team contacts the local district staff or maintenance contractor to check on/update the situation. Emergency Services – Sometimes, other first responders like the RCMP need to close a road, and they do so before letting our staff and maintenance contractors know or before we arrive on the scene. This may cause a discrepancy or delay between what’s happening on the highway and what is actually being posted to DriveBC. Safety First – Ministry staff and maintenance contractors are often involved directly with the emergency response taking place on scene, so if urgent actions need to be taken right away, this may cause a delay in inputting data. Emergency On Scene – It can sometimes be difficult to estimate opening times due to the thorough investigations that occur alongside motor vehicle incidents. Often, traffic analysts must be called into remote locations and the road cannot be opened until then. To really help you, it’s important for us to provide timely and accurate information regarding road closures, planned maintenance work and extreme weather conditions through DriveBC. We hope you continue to use our website when planning that next BC road trip to help you know before you go. If you have any other questions, let us know in the comments below and we will try to get you an answer. Highway 93, between Castle Junction and Radium is a federally operated section of highway. The federal government relays road condition information to our staff, who update DriveBC accordingly. While we try to keep the lines of communication open and information up to date, there can sometimes be a delay in the information we receive. For conditions within the national parks we deal generally with the Banff Parks Dispatch. Thanks for your comment. Sorry, but we just need to clarify, are you referring to the incident (! and triangle) icon on DriveBC? You can select what layers of information you would like to see on the DriveBC map and the incident button is one of those layers. If a road is closed, it will be listed in this category. If there is reduced access to a road due to rockslides, etc., that will also be captured in this category. Are you wondering why construction work to fix a road after an incident isn’t moved to the construction category? Thanks for your help clarifying. We will share your response back for review once we have heard back from you. Thanks for your comment commercial driver, is there any location in particular you are concerned about? We can send it forward for review. the no stopping and no parking signs but this is really ridiculous!! !